Welcome to 2016 Season 3! This season release features the brand new Italian road course, Autodromo Enzo e Dino Ferrari, better known as Imola! We have performed an extensive update to all track surfaces to better model physics collisions, even with tiny particles like sparks, gravel, and marbles. The dynamic track surface now includes dust and gravel, which is brought onto the racing surface from off-track excursions and affects tire grip. Also, we have added the ability to retrieve more accurate statistics on Incident Points for all racers, even in Replay mode. Some time was also spent adjusting the 2014 V8 Supercars to improve their stability, and handling, and bringing the 2016 digital dashboards to the NASCAR Sprint Cup series’ vehicles. We’ve even added preliminary DirectX 11 support for those of you with an Oculus Rift! Finally, we have completed an artistic overhaul of the South Boston Speedway to help it shine with the latest iRacing graphics updates. Along with a host of bug fixes, balance tweaks, and minor updates, we hope you enjoy the 2016 Season 3 Release! – The Race Guide now has a filter for filtering out “unofficial” sessions. – League Admins may now quickly add a session to one of their active league seasons by clicking the plus icon when looking at their “All Leagues/Find Leagues” page. – The Set Up Grid button has been moved up the page to a more relevant position when setting up a league session. – The Grid Builder context menu now positions itself correctly to correlate with the Racer Grid position. – The My Series Results page now features a dropdown menu for jumping to a specific page of results. – The Date column on the My Series Results page now displays the LOCAL date and time in the cell, and both GMT and LOCAL time in the tooltip. – The My Series Results page now shows detailed pagination details for searches with more results than can be displayed (ie: Showing Results 1-25 of 36 Total Results). – When a user selects a series on the Series Results page, the page will now look for data relevant to that selected series. If any is available, the page will display a link that takes the user to the archival page that shows ALL results from ALL races from that season. – Adding an item to your cart should now be more responsive. – Adjusted the font sizes of the homepage News section for increased readability. – Fixed the myRacers Online pop-out menu. – Fixed an issue where sometimes a racer would be prevented from joining a session because they required updates, when in fact the racer was up to date. – Fixed an issue that prevented you from joining your friends’ sessions directly from the myRacers persistent footer. – Fixed an issue that sometimes prevented you from joining an open practice session. – Fixed an issue that sometimes prevented the Race Panel from populating correctly where looking at Series Stats or Results pages. – Fixed an issue where duplicate entries could be seen for each Team Session on the myTeam Racing page. – Fixed functionality for scrolling while dragging drivers around the Race Setup Grid and for the context menu for moving drivers. – Fixed an issue where the Lap Results page could sometimes break when data was emerging slowly. – Fixed an issue on the My Personal Stats page where your last 10 races sometimes would not load. – Fixed the Settings Panel so that when opting to not use IPv6, your selection is saved correctly. – Fixed an issue where sometimes the side splash panels would not display correctly. – Fixed an issue with the display of promotional prices where they would drop a zero from the cents value. – Fixed an issue where some users were able to see region restricted series for which they were not qualified. – All chat features have been removed. – The Previous and Past Seasons page is now depreciated. – Leo Bodnar, Simability, and Simsteering logos have been added to the Paint Kit. – The Inside Sim Racing logo has been revised. – The description of the “maxParticleThreads” option in the “app.ini” file has been updated to include the value of “0” as an acceptable option. – Fixed a bug that was preventing League Sessions with qualifiers and without a race from using shared pit stalls. – Dust and gravel can now be dragged and thrown onto the track by wayward cars, which then interacts with the tires to affect grip and accumulation of debris on the tires. – The way the Dynamic Track is stored in a replay has been improved to allow sudden changes in the track surface state to be seen immediately. – The cubemaps for all tracks have been updated. This will cause much brighter reflections off of objects. – Post-processing effects have been removed from the cubemaps for all night tracks. This was useful in the past, but is no longer needed. – Fixed occlusion culling so that very large nearby objects no longer incorrectly disappear, especially in mirrors. – Fixed a crash that could happen when trying to draw a lot of cars in the world with headlights. – Improved the algorithm for updating Dynamic Track textures to ensure timely graphical updates. – The option, “DynamicTrackTextureUpdateRate,” has been added to the “renderer.ini” file to control the maximum frequency of Dynamic Track texture updates. – The option, “ParticlesDetail,” has been renamed to “ParticleDetail” in the “renderer.ini” file. – Hang logging is now disabled by default, but can be enabled in order to help us investigate issues. – Fixed a memory leak that occurred when rendering a Tech Track. – Tech Tracks utilizing direct laser scan data can now be rendered in DirectX 11. – Glowing light effects now interact more accurately with fog. – Ghost car now renders correctly. – The old spark system is now hidden if PopcornFX is active, due to the new PopcornFX spark system. – Adjusted the graphical autoconfig selection of default graphics modes to favor higher refresh rates and standard scaling modes. – Fixed several bugs with night lighting and high detail headlights, where DX11 could look significantly different than DX9. – Fixed an issue with track shaders when using “Low” Shader Detail. – Fixed an issue where random flickers of geometry could render along with some particles. – Fixed several issues related to the antialiasing of painted lines and other surface decals at both night and day tracks. – Fixed an issue where tire rims could appear white when using the “Low” Shader Detail setting. – Fixed the Sim’s UI to correctly toggle between fullscreen and windowed cursor modes when the Sim toggles between fullscreen and windowed modes. – Fixed an issue where shadow volume geometry was being created at load time even when the “ShaderQuality” option in the “DX11.ini” file was set to 0. – If DirectX 11 fails to report a display mode, a fake display mode is created. This may allow the Simulator to operate in a windowed display mode or a fake fullscreen. 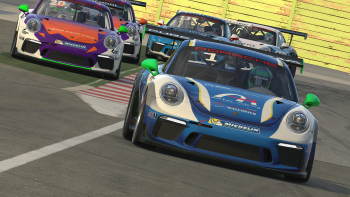 – All new installations of iRacing will now default to DirectX 11. – All tracks now have complete particle collision, so particles such as dirt, sparks, and gravel can bounce along the surface instead of passing through the environment. – Improved road rolling, aero, and wind sounds for all vehicles. – Scrape noises for Armco fence rails and vehicle undertrays have been improved. – Improved the effective tire grip calculations related to marbles and dust on track. – The Info tab on the Session screen will now show your incident point count for the current session. In a team event, it will also show the count for your team as a whole. – The Entries tab now has a new “INCS” column. In a live session, you will see the incident point counts for the current session. There is no way to “back up” and see the incident point counts for prior sessions. In race sessions, everyone is only able to see their own team’s incident point counts. However, in a non-race session, or once a race session is complete, everyone is able to see the incident point counts for everyone. Admins are also able to see the incident point counts for everyone during a race session. – When watching a replay, you will see the incident point counts for the session replay you are currently watching. The same session visibility restrictions apply to watching replays (so you can not circumvent the restriction during an event by having a teammate save the replay, and load it to see everyone’s incident point counts). – Fixed a rare issue that could allow you to transmit a text chat message that would be rejected by the race server. If the configuration of your radio changed just as you finished the message, it was possible that the message would be created with the identifying information from the prior configuration of the radio. – Timestamp will no longer appear on screen captures. – A new video capture library has been added. – Fixed an issue that was preventing some members from utilizing this feature. – – “PlayerCarTeamIncidentCount” = Incident count this session for your whole team. – – “PlayerCarMyIncidentCount” = Incident count this session just for you. – – “PlayerCarDriverIncidentCount” = Incident count this session for the current team driver. – A new session string entry, “WeekendInfo:WeekendOptions:IncidentLimit:,” has been added that indicates the maximum incidents you can receive before being ejected from the session. – A new telemetry variable, “PlayerTrackSurface,” has been added that indicates the track surface under the player vehicle. This is available both live and on disk. – A new telemetry variable, “PlayerCarIdx,” has been added that allows developers to access the current player’s car index without loading up the session string. This is available both live and on disk. – Fixed a bug where setup information in a telemetry session string could become stale. – A new iRacing SDK disk client C++ wrapper has been added that will allow you to read “.ibt” files with less effort. – A new iRacing SDK example application, “irsdk_ffbforce,” has been added that can analyze the wheel torque data found in our telemetry files. – A new Force Feedback demo (ffb_demo) has been added that can help users setup Force Feedback for their racing wheel in the Sim. – ARX clients can now send text chat messages to the Sim via the call: irArx.sendChatString(“message”). Additionally, these messages can include macro commands. – Support for the consumer version of the Oculus Rift has been added to iRacing, based on the Oculus 1.3.2 SDK. This new support is available only in the DirectX 11 version of the Simulator. The DirectX 9 version of the Simulator is still based on the Oculus 0.4.2 BETA SDK. – Whenever the Oculus Rift is in use, the Simulator will mirror its output to a resizable window on the desktop. You may resize/position this window. Using a very small mirror window may reduce mouse pointer precision inside of the Rift, so try not to make it too tiny. The window will remember any adjustments to dimensions/positions between sessions. – – PixelsPerDisplayPixel=150 ; (50% to 300%): 125%=1.25, over 100% may hurt performance! – – MirrorEnabled=1 ; Create mirror texture and render copies on screen. – The “RiftEnabled” option allows you to disable the auto-detection of the Rift if necessary, and simply disables it completely. For instance if you do not want to be prompted to use the Rift every session, you can disable that here. – The “PixelsPerDisplayPixel” option adjusts the rendering resolution for the scene before it is warped into the Rift’s display. It defaults to 1.5 which improves quality but may hurt performance on some systems. If you are having performance problems with the Rift, try lowering this to 1.0 (100%). If you are still having issues, try lowering your graphics settings. It is important to have a good frame rate when using the Rift. – The “AutoSelect” option is useful if you always want to use the Rift, and want to automatically skip the prompt. – The “AutoCenter” option will automatically re-center the head tracking when you acknowledge the health and safety warning, or when loading completes, whichever comes first. Otherwise, to re-center tracking during loading, hit the space bar. Or to re-center tracking after loading use the assigned control (see the options screens for the “HMD re-center” command). You may reassign this command to a keyboard key combo or to a controller input. – The “UIScreenSize” and “UIScreenDistance” options control how far away and how large the user interface screens appear inside of the virtual world. – The “MirrorEnabled” option allows you to disable the mirror output rendering to the desktop window. This will save some video memory and, in some cases, slightly improve frame rate. – A new feature, called “forceMap,” has been added. By adding a file named, “forceMap.csv” to your [documents]\iRacing\ folder you can remap your racing wheel’s force output to make it more linear. See the thread http://members.iracing.com/jforum/posts/list/3482238.page for more details. – Windows 10 support for Xbox One controllers is now enabled by default. – The baseline setup for this vehicle has been updated. – The aerodynamic calculations have been adjusted with the goal of making aero performance more linear and predictable in response to changes in ride heights. Also, aero is now dependent on vehicle roll angle, so you will find greater downforce and a forward aero balance shift when cornering. Overall, these changes resulted in a rearward shift of aero balance (more aero understeer). This allowed us to reduce the size of the front anti-roll bars to a more representative dimension. Finally, we increased the aero drag penalty for running greater rear wing levels so that running maximum rear wing is not the optimum at most tracks. – Minimum vehicle weight has been increased to 7.1 kg for GT1 BOP. – The tire compound has been adjusted to better handle high operating temperatures; it now is matched to the Chevrolet Corvette C6.R GT1. – Three different selectable brake pad materials (low friction, medium friction, and high friction), will now make it easier to tune brake bite for different tracks and pedal setups. – The pit sequence has been altered so refueling takes place before tire changes. The car is not lifted onto airjacks until refueling is finished, and it continues to use two tire guns and carriers. – Mirrors have been adjusted. – Deactivated the fuel mixture increment, decrement, and level controls for this vehicle. – Throttle Shaping tooltip text has been updated to no longer overrun the available space. – Fixed a bug in the traction control algorithm so that it is now only applied if the throttle is greater than 5% (which affects both the sound and the initial transition into active traction control when applying throttle). – Aerodynamics have been modified to make them more benign; very similar in character to the GT1 cars. – Tire construction has been changed to be more forgiving at and over the limit. – Front bump rubbers have been re-introduced to better reflect real-life setups. – The aerodynamic calculations have been adjusted with the goal of making aero performance more linear and predictable in response to changes in ride heights. Also, aero is now dependent on vehicle roll angle so you will find greater downforce and a forward aero balance shift when cornering. Overall, these changes resulted in a rearward shift of aero balance (more aero understeer). This allowed us to reduce the size of the front anti-roll bar to a more representative dimension. Finally, we increased the aero drag penalty for running greater rear wing levels so that running maximum rear wing is not the optimum at most tracks. – A more temperature resistant tire compound has been added, so that the Chevrolet Corvette C6.R GT1 is more competitive with the Aston Martin DBR9 GT1, particularly in hot ambient conditions. – Indiana Donor Network sponsored KV Racing Technology Dallara DW12 Indycar scheme has been added to the Paint Kit. This is a non-color changeable scheme. – Several new Levels of Detail (LODs) have been added to the car model to aid performance, especially during night racing. – – Chassis torsional stiffness has been added. – – Available rear damping forces have been increased. – – Spring perch offsets have been added in the Garage. This provides the ability to adjust bump rubber engagements without changing ride heights via combined damper length and perch offset adjustments. Spring perch offsets that produce less than 40-50mm of shock deflection in the Garage are not recommended. – This vehicle now uses V6 tires. These tires are capable of maintaining grip at higher operating temperatures, so they should feel less greasy in hot ambient conditions and more catchable in big slides. However, be aware that grip will be slower to build when the tires are cold, so it will feel icy for the first few laps when ambient temperatures are cold. Also, you will nominally find peak grip at around the 3rd to 5th timed lap on a qualifying run. We understand this is not ideal for 2-lap qualifying runs, but felt that better grip at high operating temperatures (where the tires run most of the time) would be a worthwhile tradeoff against a relatively slow build of grip when cold. – Chassis torsional stiffness has been reduced to help the rear lose lateral grip more progressively. – Rear suspension geometry has been adjusted to slightly reduce the effect of camber sensitivity. – Fixed a display issue with the digits on the steering wheel display. – This vehicle has been converted to use PBR shaders. – Updated engine, gear shift, transmission, backfire, and rev limiter sounds, and pit limiter sounds have been added. – Slight reduction in aero drag for GT3 BOP. – Changed differential build for less overall locking and less locking on throttle to address feedback that the car snaps to oversteer when putting power down. – Updated engine, gear shift, transmission, and brake sounds. – A taller final drive has been added so now this vehicle can be used in a draft on high speed ovals. – Handling by Opponent vehicles has been improved. – Particle collision bodies, that were previously missing, have been added to this vehicle. – Various new sounds have been implemented for this vehicle, including: engine, gear shift, transmission, brakes, backfires, and limiters. – The extended length of the rear dampers has been reduced in order to prevent heavy engagement of the rear bump rubbers, which had resulted in rear instability, especially at curb strikes. – The operating temperatures of the tires have been reduced to help maintain more consistent grip throughout longer runs. – Fixed an issue with an incorrect normals texture reference with the vehicle tires. – Fixed an issue with the deployment of the Energy Recovery System (ERS). If the driver crashed repeatedly on out laps, the counter that determines the amount of energy to transfer from the ERS battery for deployment to the MGU-K did not reset. Once this counter reached a rules-specified maximum, no more energy could be transferred from the ERS battery to the MGU-K until the driver reached the next valid lap crossing. The result was that the driver may have experienced low deployment on out lap(s) until they managed to successfully complete an out lap without crashing. – The Low Fuel warning has been updated to trigger off of fuel level instead of fuel pressure. The warning now activates when the fuel level drops below 10 liters. – This vehicle has been converted to use GGX Shaders. – Vehicle appearance has been updated to match the 2016 NASCAR Season. – The template for this car has been updated to reflect the above changes. – New engine sounds have been added for this vehicle. – The 2016 NASCAR Season digital display dashboard and functionality have been added to this vehicle. The digital display used in these cars is highly customizable and the screens used vary drastically from team to team. In an attempt to give you the same options, we’ve created 3 different screens from which you can select in the F8 screen. – The fog light and upper grill decals have been updated to match the 2016 NASCAR Season. – The 2016 NASCAR Season contingencies and splitter/spoiler have been enabled. Because of this, the non-superspeedway rear spoiler can now be painted. – The appearance of the vehicle has been updated to match the 2016 NASCAR Season. – New engine sounds have been added to this vehicle. – Vehicle contingency decals have been updated to match the 2016 NASCAR Season. – Unfortunately, the developments for Season 2 did not have the desired effects on car performance, drive-ability, and real-world correlation. As a result, this vehicle has been restored to the 2016 Season 1 specifications. – Small shift rearward in aerodynamic center of pressure (10 mm) to reflect feedback from real-world drivers, resulting in more aero understeer. – This vehicle now has V6 tires that match the 2014 V8 Supercars. – Fixed an issue with cars appearing off the ground near the entrance to pit road. – NEW TRACK RELEASED! Test out your circuit racing skills on this counter-clockwise Italian racetrack steeped in history. – The Time Gain Checkpoint at Turn 1 has been updated. – Barriers have been added to the Grand Prix Circuit config to prevent use of the oval as a shortcut. – A bump has been removed from the entrance of Turn 1 on the Junior config. – A missing wall cap has been added to the pit out. – Fixed a few seams near the entrance to pit road. – The Pace Car now completely exits the race groove before the Green Flag is given. – Fixed the brake markers so they no longer disappear in “Low” Detail mode. – Fixed a pit road cheat by placing some collision volumes. – Fixed several seams that were visible in the grass area of Turn 1. – A Time Gain Checkpoint has been added on the right side of Turn 14. – Fixed an issue with white splotches and inconsistent white/red corner curb lengths in several places. – – Fixed a bump on the outside of the T1 asphalt runoff. – – Fixed a “curbed” white line at Döttinger Höhe, near the Gantry. – – A seam on the right side towards Hohenrain chicane. – – A seam on the Nordschleife at the T13 pit exit. – – A seam on the left side at Fuchsröhre. – Fixed a surface-type issue with a portion of the wall along the front stretch. – Fixed some missing textures on some terrain areas. – South Boston Speedway has received an extensive art upgrade for all track configs, including the track surface, environment objects, and structures to help it shine like new! – Fixed an issue where a scenic camera was drawing through the ground. – Fixed a bump in the track at the entrance to Turn 3. Please include the option to mirror without the double eye, chromatic aberration and distortion when using VR. It is just an option on the Rift API. It will help people to stream and share their experience because no one wants to watch on a screen the double vision video.